Cream was used in the livestock guardian cooperator program of Hampshire College in Massachusetts. Cooperators using the dogs had no knowledge of the ownership of the dogs. 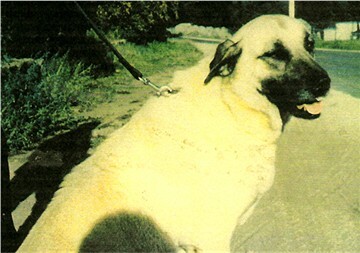 Cream was one of two tiny pups (the other was Peaches) procured in Turkey by Dr. Ray Coppinger, Hampshire College, in 1980 from the Sivas-Kangal Region of Turkey. Dr. Coppinger's team was taken to see three pups a local herder had discarded at the town's dump. The herder didn't want to raise all the pups in the litter. Discarding extra pups was normal practice back then. It was a way to take some of the stress off the dam and help raise the remaining pups more successfully. For all the dogs procured on that trip the old ladies of the villages requested for payment to be in the form of unbreakable thermos bottles and heavy duty hot water bottles rather than in cash. Dr. Goldhor, an associate of Dr. Coppinger, had the owner complete blank pedigree forms and sent the import documents to the Harneds. For several years Peaches and Cream were standouts in the cooperator program at the Livestock Guarding Dog Project. When Cream had been in the program as an active working livestock guardian for about four years (in 1984), Cream was brought to California from Arkansas and bred to CHAMPION Havuz Tarak , producing just one male pup, Ch. Kayan's Toraman (Tor). 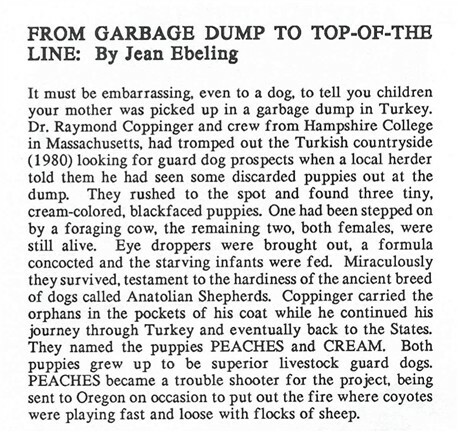 The following Article, From Garbage Dump to Top of the Line, by Jean Ebeling, is from Volume 37, page 13 of the 1991 Anatolian Times.